"We're playing in a weird space of dark comedy," the host said. "Wheel of Fortune" contestants have a chance to win lavish vacations. If you score on "The Price is Right," you can go home with a flashy sports car. "Who Wants to Be a Millionaire" occasionally makes good on its promise. But a new game show on TruTV offers contestants an altogether more practical — and perhaps somewhat depressing — prize: the chance to get out from under mountains of crippling student loan debt. 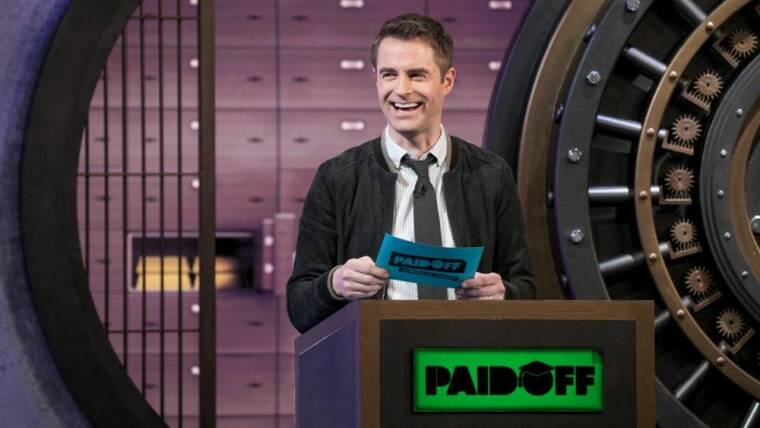 "Paid Off," a new trivia show that premieres on Tuesday, has a topical premise, to say the least. It debuts as some 45 million Americans find themselves buried under student debt — including roughly 60 percent of college graduates who owe an average of $37,172. Americans collectively owe upward of $1.4 trillion in student loan debt — a staggering sum that helps explain why so many 20- and 30-somethings have struggled to gain a foothold in the middle class, effectively cutting them off from home ownership and other investments. Michael Torpey, a New York-based actor ("Orange is the New Black") who emcees the show, readily acknowledges that a giddy, brightly lit cable TV quiz contest about one of the most burdensome financial issues in America might seem odd, to say the least. "We're playing in a weird space of dark comedy," said Torpey, who developed the show and pitched it to the executives at TruTV. "As a comedian, I think a common approach to a serious topic is to try to laugh at it first." The ground rules are fairly straightforward: Three contestants, all of whom must carry some college debt, go head-to-head on a series of trivia questions, including a few related to education. If they provide the correct answer on enough of the brain-teasers, the show will cover up to 100 percent of their loans. Torpey said he strives to balance the light-hearted trappings of a game show with an earnest, empathetic look at the student debt issue. "I want to be very respectful of the folks who come on our show, who opened their hearts and shared their struggles with us," Torpey said. "I hope this show destigmatizes debt. I mean, there are 45 million borrowers out there. It is a huge number of people!" And yet some critics have already pounced on the premise of the show, suggesting that the very concept is flippant and insensitive. "The Student Loan Game Show 'Paid Off' Is a Cruel Joke," said one headline on Paste, an online magazine. The show "treats student loan debt more as the theme of a party than a public crisis that exists for identifiable reasons," Paste wrote. TruTV, for its part, pushed back against such criticism. Lesley Goldman, the network's senior vice president of development and original programming, said the "intention" is to show that student loan debt is a "ridiculous crisis." "The best way to address the issue is with a ridiculous game show," Goldman said. Torpey said "Paid Off" tries to offer constructive tips, prodding its viewers to call their representatives in government. "We try to highlight all the different groups we think are complicit," Torpey said. "We yell at Congress, we yell at the predatory loan groups, we yell at the universities themselves."